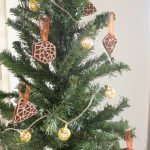 Edible Christmas ornaments – YES! 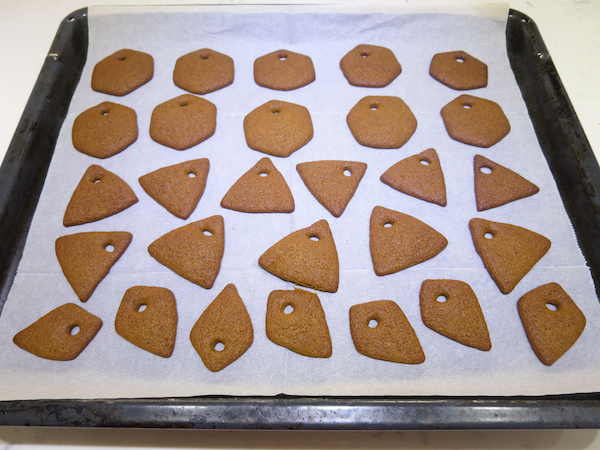 Whether you are looking for edible decorations for your Xmas tree or ideas for DIY gifts, GINGERBREAD ORNAMENTS are a versatile option for both! You can make them into any shape and decorate with icing, candies or chocolate! Thin ones stay crispy and they have a lovely christmassy spiced flavour. 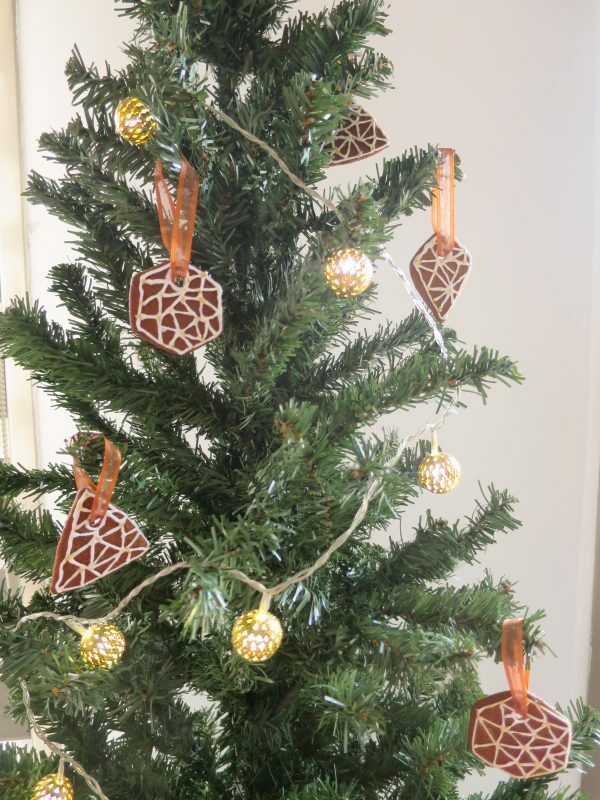 I set our tree (=artificial plastic tree) up early this year with plan to decorate it gradually until Christmas Eve, which by the way is only 26 days away!! 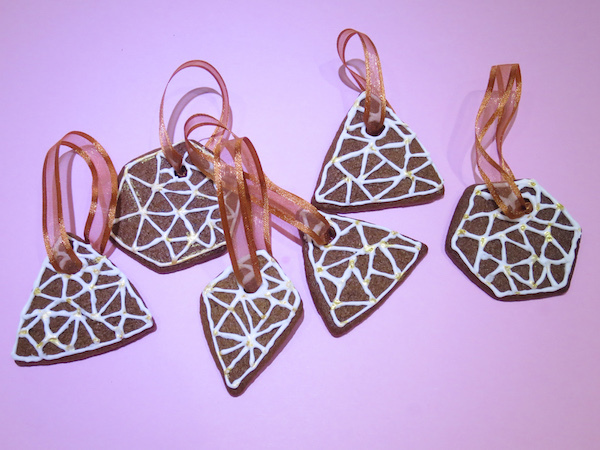 This weekend it got just lights and a few of these gingerbread ornaments I made in shape of hexagons, triangles and diamonds decorated with white royal icing with small touches of edible gold paint. I chose bronze organza ribbon that match the colour of the cookies beautifully! If you decide to make them as gifts, nice way to personalise them is to write a message on the cookies or pair them with a card to enclose your wishes with this wonderful decorative and delicious gift. I love to receive and give DIY gifts, they are personal and really warm the heart. That said, I have many more gift ideas in mind and there’ll sure be more that I’ll share with you, so stay tuned! In a medium saucepan combine butter, maple syrup, sugar and spices and place over medium heat, mixing with a wooden spoon. Bring to boil then take off heat and allow to cool a bit then add the egg mixing with a spatula. In separate bowl combine flour, baking soda and salt and sift it into the mixture folding it in with a spatula. Mix until incorporated and smooth, then turn over onto plastic wrap, cover and flatten into a disk. Refrigerate for 24 hours. When ready to bake preheat oven to 200°C (400°F) and prepare 2-3 baking sheets with parchment paper. 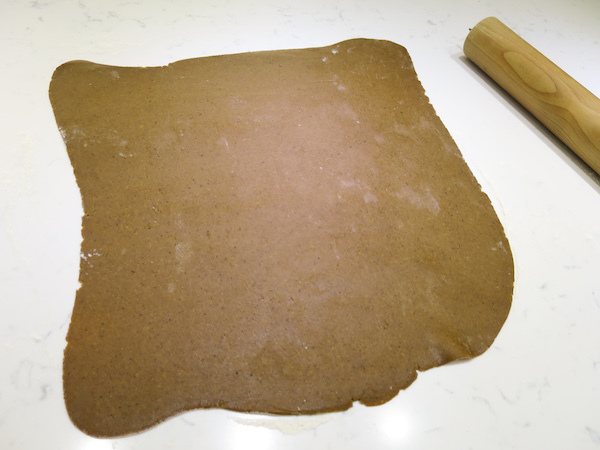 Take the dough from the refrigerator and roll out on a lightly floured surface. 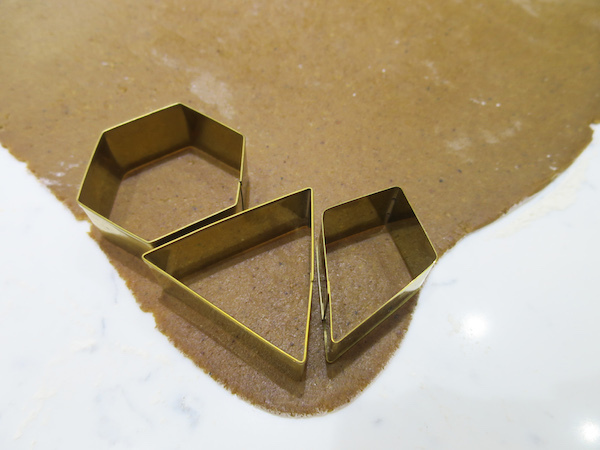 Cut out cookies using cookie cutters of your choice and place on prepared baking sheets 1 cm (0.4 inch) apart. 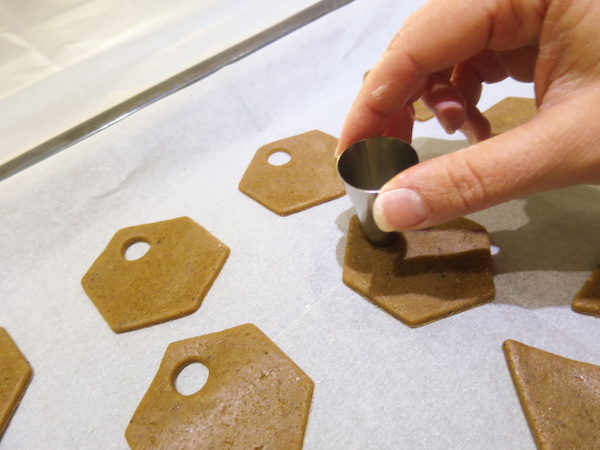 Cut hole in each cookies from where you want to hang it, you can use a small round cutter or a round piping tip. Bake in preheated oven on top oven rack for 7-9 minutes, until beautifully browned. While the cookies are cooling, prepare royal icing starting by mixing the egg white powder and water in a mixing bowl and set aside for 3 minutes. Add lemon juice and cream of tartar and start to beat on medium speed gradually increasing the speed and continuing to beat until stiff peaks form. Then add powdered sugar in two additions continuing to beat until incorporated and smooth. Test the consistency and for stiffer add a powdered sugar in small additions. If you want to use different colours, divide the icing in this stage and add colours of your choice. 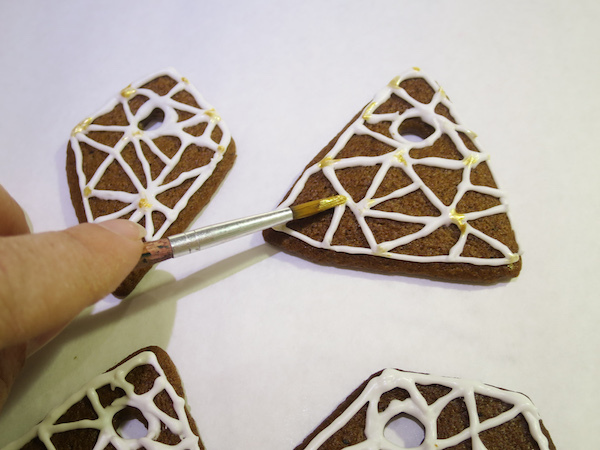 Place in piping bag with small round piping tip and draw your design on top of the cookies. 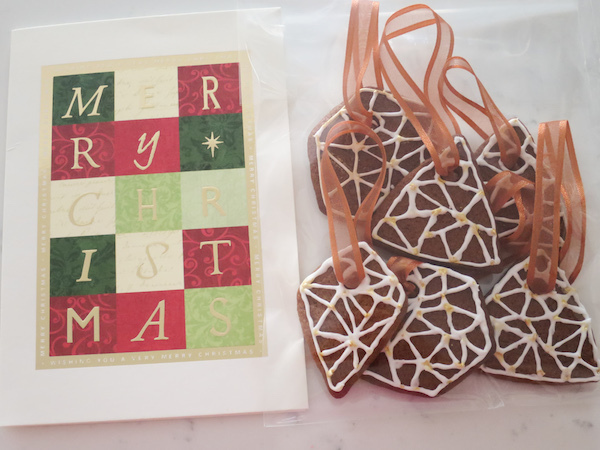 The simple design I used is to outline the cookies and draw small triangular shaped sections inside. 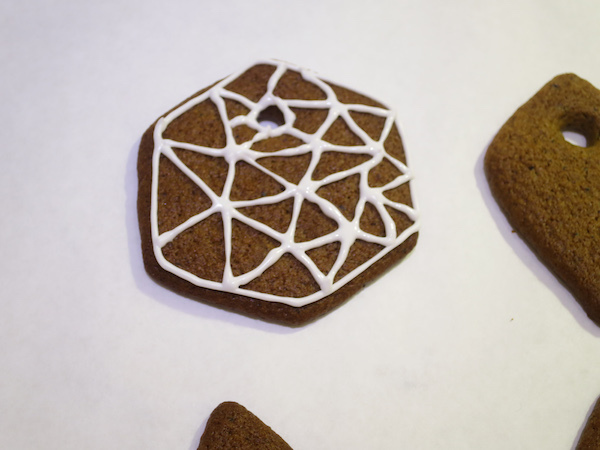 The icing dries fast and you can add some final touches with edible paint, then cut ribbon threads, pass one end through the hole and tie the ends into a tight knot. And you are ready to hang them on the tree or pack into sets of cute DIY gifts!